Aluminium sulfate, sometimes spelled aluminum or sulphate, is a chemical compound. Its chemical formula is Al2(SO4)3. 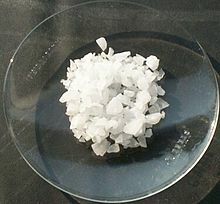 It is a white crystalline solid. It can be made by dissolving aluminium oxide in sulfuric acid. It is used to remove particles from water when it is processed for drinking. It is also used in making paper. It is used in baking powder, deodorants, slug killer, and to make garden soils more acidic. This page was last changed on 11 March 2013, at 22:20.